Yassmin obtained her law decree from Ain Shams University-English section, in 2016. She joined Eldib & Co in 2017 as a junior associate specializing in corporate and commercial law. Having joined the firm recently, Yassmin handles a variety of cases for national and multinational clients. 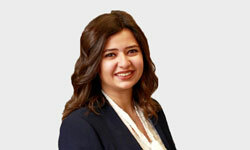 Yassmin specializes in drafting, reviewing and amending contracts, providing legal advices for clients worldwide, drafting legal reports and all corporate and commercial affairs in general.